A lovely personalised cotton tote knitting bag, the perfect gift for your Mum or Grandma on Mother's Day. These are the perfect gift for a special Mum on Mother's Day or why not even treat yourself! Perfect to store all of your balls of wool in at home! These make the perfect gift for any occasion, Birthdays, Valentines, Christmas, Weddings, Anniversaries, Easter, Mother's Day, or if you just want to treat a special family member or friend! They even make a great gift for Teachers! If you attend knitting classes this is perfect for carrying your wool in, or simply when you are on the move and want your Knitting with you, on the train, the bus or just to store your current project in! 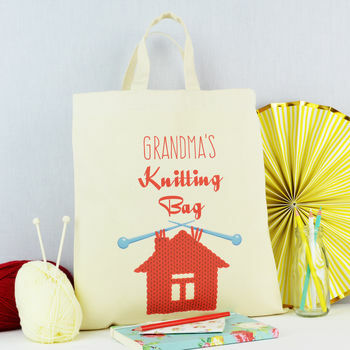 Can be customised with any name or wording at no extra cost, so for example you could have 'My Mum's Sewing bag'. 42cm tall x 36cm wide (these measurements do not include the length of the handles).